We have One Year To Go until we're locked into a fourteen year cycle of school-holiday-only (aka extortionate and packed to the gills) breaks. And we're making the most of it. With tiny man at nursery and tiniest man being home-schooled (aka tagging along to Brent Cross and house-tidying and cuddles with mama), October was the perfect time to take a break in Corfu. It's still warm, it's not far (sub three-hour flight, we didn't even have to break out the expected Paw Patrol episodes) and you can scoop amazing deals at five-star hotels because it's the 'off season'. Here's our review - and top tips for booking - at the super family-friendly Grecotel Corfu Imperial. 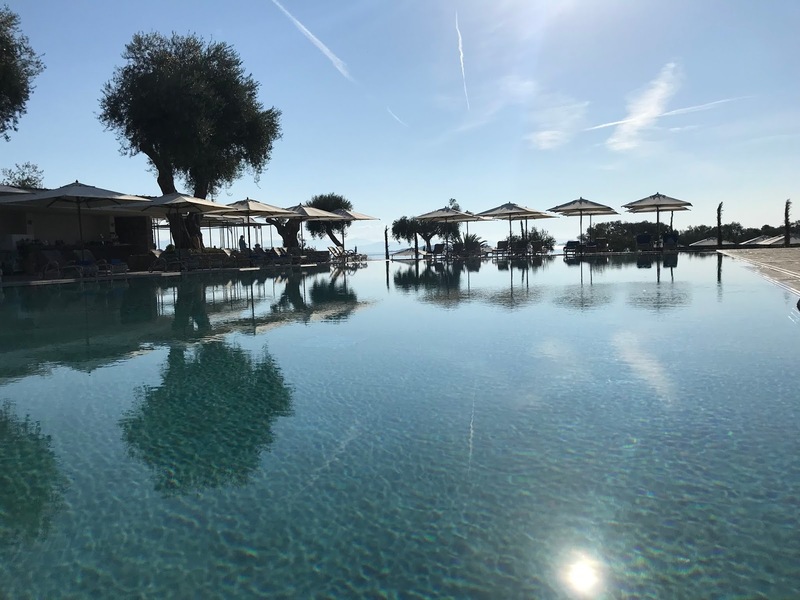 The Corfu Imperial is on a private peninsula surrounded by the Ionian sea in almost every direction, about a 20-30 minute drive from the airport. It's about a 20 minute drive to the Old Town (or 15 minutes by boat - take the hotel's water taxi for a brilliant day trip). The hotel has its own beaches - they are relatively small and can be cramped, with slightly rough sand so if you're a beach connoisseur you might want to travel to one of the more deserted options nearby. But for most families, the beaches are fine: super-calm waters, lots of buckets and spades and toys, and very attentive lounger staff. Plus that sand might not be Insta-perfect but it's ideal for sandcastle construction! The end of summer means a lot of hotels close their staffed kids' club to run skeleton timetables or nothing at all - not at the Grecotel. There was a full timetable at the free kids club - it's two rooms with lots of toys and arts and crafts activities. Over fours can be left without parents, under fours can attend with parents. The cooler temperatures in October also make it easier for babies and toddlers to enjoy the holiday - it was about 25 degrees each day of our break, although of course it can be far cooler or hotter. Activities stretched from treasure hunts to play do, and each day had a theme which the kids really enjoyed. The club also had snacks available at all times, like pastries and fresh fruit, and even ice cream. The hotel also makes it really easy for parents to travel with the range of facilities it can provide - you fill in a form before arrival and almost everything you could need on holiday with a babe is waiting for you in your room - from changing mats and potties to steps to help toddlers reach the sink, bouncer chairs, toddler toilet seats, bottle warmers, and more. Some are chargeable, but most are free. They even have a paediatrician on call if you need (at extra cost) plus nappies and beach shoes etc on sale in the mini-mart. The most kid-friendly part of the hotel, though is the food: children eat free in all the restaurants, with kids' menus and a huge array at the buffet (see below). All the restaurants have high chairs and baby food too. .... was delicious and the buffet had a huge range of options, although after seven days it did inevitably feel a little repetitive. On half board, you receive €20 per person to spend in the resort's other restaurants, a Mediterranean option, a fine dining restaurant (which alternated between French and Asian & Latin American fusion), a pool restaurant & bar, a bar in the lobby and an all-day seafront fish restaurant) were all upmarket (the €20 would cover one starter) but at the pizzeria, we enjoyed yummy and reasonable pizzas. The buffet hosted brilliant, imaginative salads, cheeses and meats, about 10 main course options include meat and vegetarian, and pasta with different sauces every day (a favourite with the kids...) plus epic desserts, especially the baklava and the kids loved the ice cream sundae station. The main complaint from guests was that the hot food could be hotter. Cocktails were all 20% cheaper in October, and fairly reasonable at around €8-€10. The breakfasts were particularly great, with a wide range of croissants, pancakes, waffles, fruit, yogurts, meats, cooked options, smoothies, juices and more. ... include a huge main pool and a second infinity one (unheated in October, but still OK at around 25 degrees - could do with some extra loungers for the size of hotel, though). There's a beautiful and relaxing spa and gym, and tennis courts, plus a watersports facility. We found the sea was warmer than the outdoor pools, and very popular for a relaxing dip - it's a blue flag beach with lifeguards. We enjoyed the live music entertainment in the evenings, and there was a kids' disco that our tots loved - although when we and the few other guests there with young kids asked if it could be repeated, the staff weren't keen to help. The hotel offers a huge range of rooms - rates stretch from €200-€5000 from a small room to a huge villa. We were in a family beach bungalow suite and it was perfect. Very spacious, and tiniest man could sleep in his own lounge space in the night - it meant we could have more of an evening rather than go to bed at the same time as him! There were two bathrooms and a kitchenette for easy snack or meal-prep. These rooms have grassy terraces and are seconds away from the beach, meaning they're great to pop back for nap times or if you forgot the vital Paw Patrol figurine that beach play requires that morning..! We enjoyed a day trip to the Old Town - and the hotel's water taxi was our favourite part. It's €15 return for adults, free for kids, and an open-top, leather-seated speed boat which made for a brilliant journey. Or there's a free shuttle. The Old Town has cobbled streets and tiny market lanes, lots of cafes, and castles to explore. The Gerald Durrell playground in the centre is good for kids to let off steam. The hotel also offers a free shuttle service to other Grecotel hotels nearby, and you can eat at their restaurants (included in half board deals) too. The hotel's staff were very friendly, especially the cleaning staff who really love kids! The main beach area was fairly cramped, but we and some other families with young kids adopted the second beach area; it's meant for villa-guests but given the off season and low occupancy of villas, we were allowed to spread out in the cabanas here - and enjoy the free fruit pots and iced tea which were lovely on the beach! 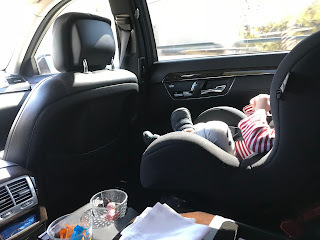 The hotel's transfers were also brilliant and child-friendly: our airport drop offs included age-appropriate car seats and even in-car snacks: the perfect arrival in Corfu. * We paid for our stay at the Corfu Imperial (but in any case we're seriously gobby and only rave about things we really love).